The current maintenance work that has one northbound and two southbound lanes shut down on the Hoan Bridge is just a band-aid to keep it open until it is re-decked in 2013. The Milwaukee Journal Sentinel recently reported that the “Hoan Bridge is poised for a 21st century makeover.” Gov. Walker announced that the three-year project to reconstruct the bridge will begin in 2013. The project is estimate to cost “taxpayers” upwards of $350 million, along with the $7 million maintenance repairs going on right now, and is intended to keep the bridge upright for the next 40-50 years. My daughter Frankie coasting down the Hoan during the Miller Lite Ride for the Arts. If we are going to get a bicycle and pedestrian path over that bridge in our lifetimes, we will have to do it with this re-decking project, and the preliminary engineering for that is going on as you read this. Responding to public pressure, the Wisconsin Dept. of Transportation recently agreed to “study” the feasibility of a path on the bridge. Perhaps their institutional memory has been shortened with the recent spate of retirees, but in 2002 WisDOT payed a consulting firm $84,097 to come up with the Downtown to Bayview Bicycle Route Plan to do just that. The result of that study was not only is it feasible to put a path on the bridge, it can be done easily and at little cost. WisDOT’s consultant, URS, recommended the multi-use path be put on the east side of the bridge in the northbound shoulder. There design shows a concrete parapet wall between the motor vehicle lanes and the path and either a higher railing or a fence on the outside wall. You can see that design below. The primary objection to this design at the time was that all the lanes would be needed when the Marquette interchange reconstruction diverted traffic to the Hoan. Well, the Marquette is done and won’t need to be redone for another 40 years. The only remaining objection to the project is that traffic volumes warrant all those lanes. In 2002, when the URS study was published the objectors suggested a suggested a doomsday scenario in which future traffic volumes create bumper to bumper traffic jams if we remove a motor vehicle lane. Well, it is not ten years later, welcome to doomsday. The current maintenance work on the Hoan not only has closed down a travel lane, but the shoulder as well. Last time I checked, the world was still spinning on its axis, but what is life like for commuters who have to drive over the Hoan every day? Are they stuck in Los Angeles-like traffic jams? I decided to check and made videos of peak hour traffic (between 7 am and 8 am) on three different days from three different locations. Guess what? Not only are cars not stuck in traffic jams like they are coming into downtown from the north, and west, traffic is actually free flowing and moving at 50 mph with plenty of gaps. The video above was shot during morning rush hour from the breakdown lane when it was closed for repair earlier this summer. You can see the traffic is speeding along and there are plenty of gaps. The video above shows morning peak hour traffic with one northbound travel lane closed and the breakdown lane closed, a worse situation than proposed if the path is built. You can still see free-flowing traffic and lots of gaps. The video above was shot just before 8am from the 34th floor of the US Bank building. While the bridge is busy, it is hardly jammed with traffic. Cars are moving at 50mph with plenty of gaps even with two full lanes closed and the traffic forced into the shoulder and regular outside travel lane. Thanks to the lane closures caused by ongoing maintenance work on the Hoan, we have been given a glimpse of he worst case traffic scenario should a bike path remove one lane of traffic for motor vehicles. The facts are that the Lake Parkway feeds the Hoan with two lanes from the south and the three lane Hoan goes down to two lanes to feed I794 west. Neither traffic volumes nor roadway geometry warrant three lanes on the bridge. So what’s stopping us now? Dave, thanks for continuing to push for this. It has to happen!!! Dave, in a nod to Alvin Lee and 10 Years After, if the study was done 10 years earlier then pull it out of the drawer and lets make it happen. Not to forget Micky Dolenz who plays Festa this week “I’m a Believer” now in the Hoan bicycle project. I wasn’t in the past. My apologies to Nic Kovak and the 52 crew for not seeing the light earlier. Any ideas about who we should write to as a means of moving the project ahead. Having once worked in government “studies” concern me. Nice music references Michael! As far as who to contact, the only locally elected official I am aware of that is in opposition to a path is Supervisor Patricia Jursik http://county.milwaukee.gov/Jursik who is a cyclist herself. At this time she supports the path, but is afraid to lose a lane of traffic, and wants a much more expensive marsupial or cantilevered path. I hope my videos can sway her that we just don’t need that extra lane. I guess if you could stomach the neo-conservatism, and were armed with the facts, you could call in to Charlie Sykes or Mark Belling and tell them that as a Rockefeller Republican and fiscal conservative, you support maximizing the return on investment for the Hoan by allowing bikes and peds up there one way or another. Since this sounds like a State DOT project – what is the Bike Fed doing at the State level to make this happen? Also, I thought the Fed money coming in for this project also has some bike and ped stipulations – is this true? We are advocating at all levels for this at the State. Dave, do you know how that 2002 report treated the ramps getting onto the bridge? Segregated lanes, striping? The body of the bridge is quite wide but the ramps (that I assume would be used) are much narrower. 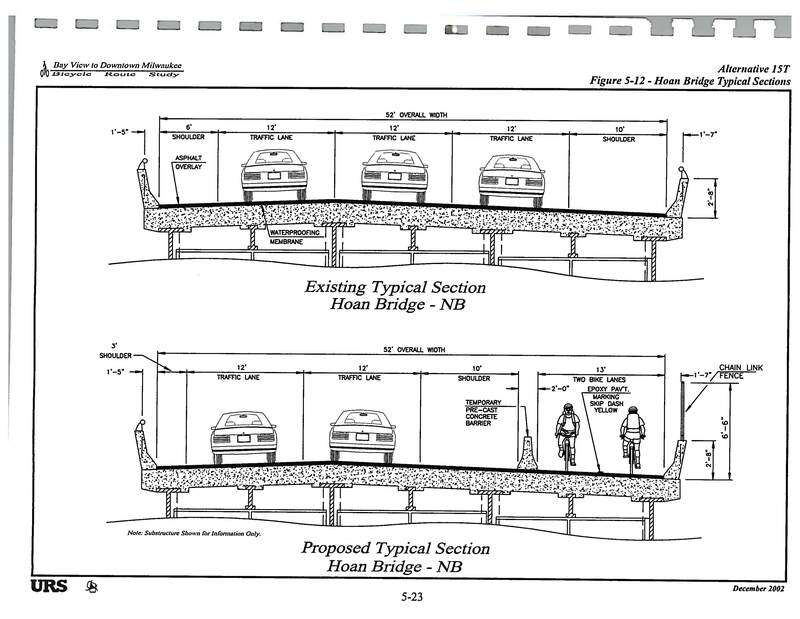 For the most part the ramps are touching the ground so they could be widened (if necessary), but there is a segment of ramp that is a span over E Lincoln Ave.
I’m curious about this as well. With the current design, I’m not sure I would enjoy biking the on and offs at the south end. Would it be possible to somehow connect this to the upgraded lanes on Bay St? Marion, per my comment to Gary, the on ramps would need to be improved as well. A complete redesign of the on ramps is actually proposed for development reasons. That said, the north end requires very little, since the 10ft wide shoulder runs the full length to the Summerfest bus turn-off onto Harbor Dr. The south on ramp off Carferry Dr would require a bit more work to add bicycle accommodations. Ramp reconfigurations are often part of freeway reconstruction projects. Just take a look at all the ramps that were reconstructed, changed, removed and added with the Marquette Interchange project. The same can be seen if you look at the I94 project from Howard south past the Mitchell Interchange. No expense was spared to improve those ramps, including widening bridges and digging multi-million dollar tunnels. It would relatively cheap to add the bicycle accommodations to the ramp at Carferry. Gary, those issues at the ramps, particularly the one at Carferry, have been addressed with a couple of different proposed designs in the 2002 URS recommendations. 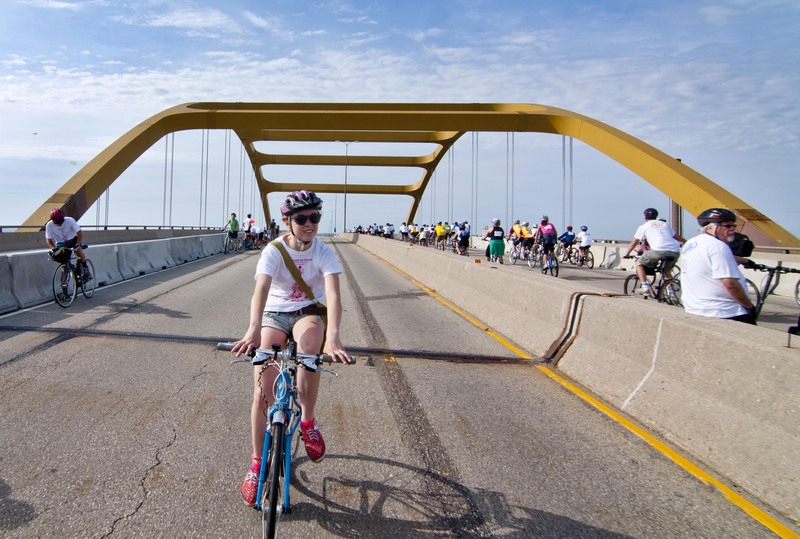 Granted the suburban country-club Republicans want no part of a bike route over the Hoan Bridge, but the city dweller who chooses a bicycle over a car appreciates the potential of opening up the Hoan to bicyclists. On the last UPAF Ride for the Arts, I thought that Milwaukee’s Bicyclists showed that the Hoan with the right modifications, is bikeable. North Shore cyclists going south and South Shore cyclists going north can appreciate not only the view, but the time and aggravation saved with a Hoan Bridge Route. We need the perseverance of Dan Janson, but we can get this route. Nice revealing presentation Dave. The visual support really tells the story — I’ll call this project a no-brainer. For a drop in the bucket, we can vastly improve the, dare I say, “boondoggle” of a bridge and turn it into a true asset. Keep pushing, this really has to happen. We also need to see the tangled web of pedestrian hell reconfigured at the Northern base such that the Summerfest grounds and museum campus has a proper, pedestrian and bike-friendly connection to the city. I’m all for bike/ped lane over the Hoan. Its a beautiful part of our city. I would love to see the arches lit up as a welcome gate to Milwaukee. If there is to be a bike/ped lane over the Hoan, it would also be important to have better access to Lincoln Ave/Bay View. Currently even if there was a lane it would still be more convenient for me to take KK/1st street even though I live at Potter and Bay. Please let us hope for better access to this lane via possibly Lincoln and/or Delaware. also…there is a public meeting manana at the Beulah Brinton Center to “Save the Hoan” Hope there is a great turn out! Dave- I’m a little confused with your posts here and your comments on the Bay View Compass editorial from Supervisor Jursik. There, you seemed to indicate that the bike path is practically guaranteed – thanks to federal law – as long as it costs less than $70 million (20%). But here you seem a bit less confident in the path’s success. Can you clarify? Well, the problem is that laws still need to be interpreted and enforced. While the federal rules that require bicycle accommodations on bridges were clearly written for a bridge just like the Hoan, it remains possible that it could be ignored through political pressure and bureaucratic resistance. The Bike Fed, the City of Milwaukee, and the Lakefront Committee all support the path over the Hoan, but for some reason, Supervisor Jursik does not. In the past, the people at WisDOT and the regional Federal Highway Association people have not supported a path despite the federal ruling. We certainly still need strong grass roots support. People need to call their elected representatives. Well Tom, if we don’t get it this time, neither you nor I may live to see a path over that bridge. Let’s do it! I was pleased to see that the Sierra Club supported the bike/pedestrian lanes previously. What is the case for adding a bike/ped. lane? Even if it is feasible, what is the point of putting a bike/ped. lane over the bridge? Is there a legitimate public need that which a bike lane will satisfy? Regardless of where the money comes from (fed., state, local), its our tax dollars. Its not free or someone else’s money if a project is funded by the state or fed. That is a good question Jim. Those of us in the Milwaukee area are so familiar with the issue that perhaps we spend too much time refuting the arguments against putting a path on the bridge and forget to make the case for the path on the bridge. I have asked a long-time advocate for the path on the Hoan to make just that case. I hope to publish his argument Monday morning, and that should definitively answer your question. In the meantime, may I ask where you live that you are unfamiliar with the issue? I am the new communications director for the Bicycle Federation of Wisconsin, and I am working to do a better job getting our messages heard statewide. Because our offices are in Milwaukee and Madison, the organization has tended to focus on those areas. We are working to work more effectively at the statewide level. Thanks for the question, and check back Monday for what should be a very well articulated answer.